Arthur C. Clarke famously wrote that any sufficiently advanced technology is indistinguishable from magic. End users feel that magic the first time a technology comes to market: imagine the reaction of the first regular person to see fire, use an engine, listen to a radio, or send an email. For technology developers, the sense of magic comes later as layers of abstraction pile up. The developer of the latest social-media chat app has no need to know how the underlying operating system, computers, internet, and voice codecs work. Knowledge of these details is unnecessary, and the developers’ productivity is far greater by building atop these layers developed by others. For these reasons, system developers favor creating software over custom hardware. The software realm is abstract—unconstrained by time, power, cost, size, heat, and other realities. Sometimes, however, these realities intrude, and software running on a server proves inefficient and slow. This can happen even in cloud data centers, where acres of servers provide the illusion of unbounded computing power, storage capacity, and network connectivity. As a result, cloud companies find it advantageous to offload functions from servers’ main processors in certain circumstances. At the same time, they do not want to entirely forgo the benefits of software implementations or force changes to their server-processors’ software stack. Cloud companies, therefore, are supplementing or offloading their server processors with companion processors or SoCs dedicated to key functions. These functions are still software based and unobtrusively slot into the server’s software stack. This approach is becoming common in storage applications, such as photo-sharing services, and networking applications. Networking applications are less obvious, being hidden behind the scenes of consumer-facing services. Think, however, about the wizardry that takes the search query you type in your web browser and ultimately routes you to a server half a continent away containing the answer to your question. In the cloud, solid-state drives (SSD) provide hot storage, and a single storage system may serve more than 100 applications concurrently owing to the cloud’s multitenancy. This concurrency grows as host processors scale out by integrating more CPUs. Solid-state drives, however, optimize sequential writes like their rotating-media forebears, on the assumption it was still 2005 and drives still serve a single workload. The result is that throughput and latency for writes to the SSD are lower and more variable. Changes on the host to adapt to SSD’s performance characteristics may need to be reimplemented when the company installs the next generation of SSD. SSD generations are shorter than that for host processors and track flash memory. It’s 2018 now and cloud companies have slipped behind technologies’ steering wheel. 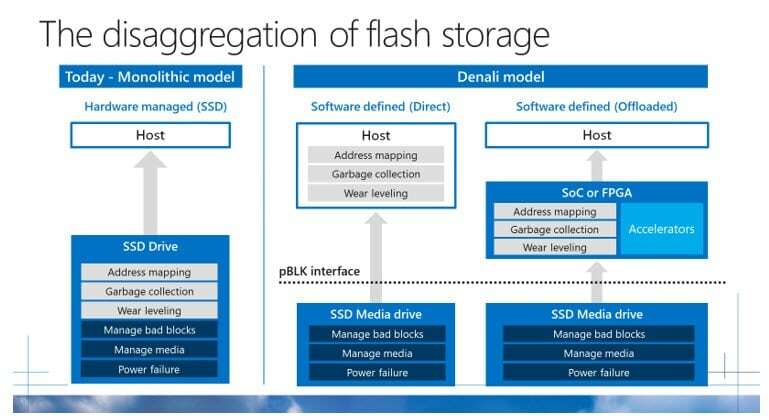 Among the technologies that have surfaced is a contribution from Microsoft Azure to the Open Compute Project for a new architecture for cloud SSD storage, Project Denali. Denali removes data-layout functions from the SSD, redesigning them to address cloud workloads. They can run on the host processor, consuming cycles otherwise used for applications. Alternatively, they can run on an accelerator. Keen to help these companies usher in a better way to dish our blogs and videos, NXP supports this architecture with an add-in card based on a Layerscape processor. This design uses the multiple PCIe controllers integrated in Layerscape processors to connect to the host processor and M.2 SSD. The processor performs the functions in the gray boxes in Vaid’s figure, the functions removed from today’s SSD. As the block diagram below shows, the card has two physical SSDs. The software on the Layerscape processor combines their capacity and chops it up to present it as more than 100 virtual drives to the virtual machines on the host. Owing to the hardware accelerators Layerscape integrates, the NXP storage accelerator can also efficiently compress and encrypt data—functions that would otherwise consume host-processor cycles. Storage accelerator based on a Layerscape processor. Cloud companies also turn to add-in cards to accelerate network functions. Standard network interface cards (NICs) excel at basic Ethernet connectivity, handling overlay protocols for a limited number of flows, and offloading stateless TCP functions from the host. Unfortunately for cloud service providers, these NICs lack the flexibility to implement proprietary functions or operate at a higher network layer, such as IPsec. They are also constrained by the limited memory integrated in the NIC’s controller chip. Cloud companies, therefore, have turned to intelligent NICs, also known as smart or programmable NICs. As the latter name implies, these cards have both general-purpose processing capability and dedicated network functions. The easiest way to get this combination is to use a processor like those in the Layerscape family, the whole purpose of which is melding general-purpose and network-specific processing. Layerscape processors with the NXP Data Plane Acceleration Architecture (DPAA) can parse complex encapsulations, apply quality of service rules through sophisticated queuing mechanisms, and steer packets to the onboard CPUs or the host processor. Off-chip memory eliminates a critical limitation of dedicated NIC controller chips. The Layerscape SoC can also fully offload IPsec and other security functions from the host. The saving in host CPU cycles by offloading IPsec is significant. A 25-core server host may need to allocate 20% of its cores just to handle IPsec, which is uneconomical considering the server processor could cost thousands of dollars. Just like the host processor, Layerscape’s onboard CPUs can run Linux and offer cloud companies the ability to easily move functions between the host CPU and the SoC CPUs or to add their own special functions. The similarity ends there. Integrating PCIe and Ethernet interfaces, Layerscape family members are an economical, power-efficient, and small-form factor solution to building an iNIC NXP also supplies important enabling software and support services. Cooler than each of the above examples is the combination of the two. Cloud service providers can combine offloads in a single add-in card, selecting a Layerscape processor with more CPUs and interface lanes to simultaneously offload storage and networking functions. With that level of integration, the cloud company could can say buh-bye to the expensive host processor, adapting the add-in design to operate independently. In a surprise turnabout, the Layerscape SoC, then, is the host of a storage-networking system, playing not a supporting role in a system but the primary one. Its lower power, better integration, and selected hardware offloads make it a better performing and more economical solution than a server host processor. Such economics are ultimately as important as the improved efficiency and performance gained from offloading functions to a Layerscape-based accelerator. After all, cloud companies are big businesses, and server processors are expensive. Reducing their load frees cycles for other, revenue-generating use. This reduction alternatively reduces the number of machines that must be deployed, reducing cost. Like magic, SoC devices, like Layerscape processors, are improving data centers. NXP is engaged with cloud service providers, helping them use Layerscape SoC devices to bring their data centers to the next level of performance and efficiency.